THURSDAY. I was so bummed when I missed out on the Céline inspired, limited edition skateboards that Jayne from Stop it right now created back in 2011 and have been on the hunt for one since. Luckily enough, a few of the decks popped up on her shop again just before Christmas, and it took me about 2 seconds to whip out my credit card and order one. It truly is a work of art and I love the pop of color it brings to my mostly black/white home! lovely and what a great find! Such a great idea, it is beautiful! Nice touch of color! the perfect place babe ! OMG, it is so cool! This is so cool! Never thought of doing anything like this, thanks for the post! it looks so good! adds just the right amount of color. It’s the perfect amount of color and enhances your black and white themed room! Beautiful interior. Can I ask you how much you paid for the skateboard deck? Thanks! Gorgeous and what a lovely home! Nice, I thought the prints were Proenza Schouler on that skateboard, cool nonetheless. Your flat looks stunning and that board really adds the perfect splash of colour to it! Loveeee this deco style Carolina! really love the photography, the room looks amazing!! I just love the rug on your floor. Can I ask where you have bought it? it’s a real eye-catcher. so lovely! If this is your house, then I think I would like a sleepover! Love it! Honestly my attention is all on your beautiful monochromatic bed!!! 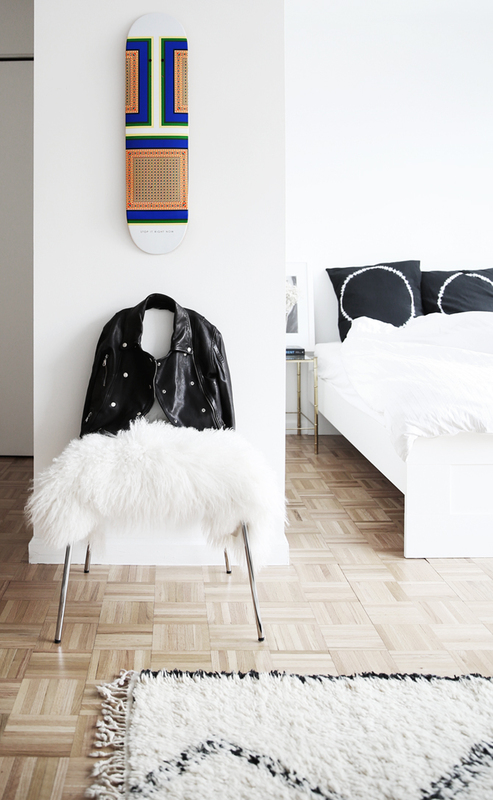 Love your decor but love the leather jacket even more! That is a great idea using it as a piece of art! Omg, that photo is great. Love your blog!! i love this so much, i wanted one so badly before! This is sooo beautiful in your home! looks so good! I’ve been on the search for a great piece like that! The interior is so inspiring! love this cool post!!!!! especially this Celine prints board!!! Vart är mattan ifrån? Så fin!